Candy Martin turned on her television Tuesday to see her family’s vacation compound near Big Bear at the center of a standoff between law enforcement officers and a man believed to a fugitive ex-police officer wanted in connection with a string of revenge-style slayings. "At first it was just utter shock," Martin told NBC 4 during an exclusive on-camera interview. "And we’re looking and we say, 'Oh these are cabins, these look like,' and there’s no doubt that those are my cabins." Martin said it was "surreal" to see the Seven Oaks Mountain Cabins on the news as the purported hiding place for a man believed to be former LAPD Officer Christopher Dorner. 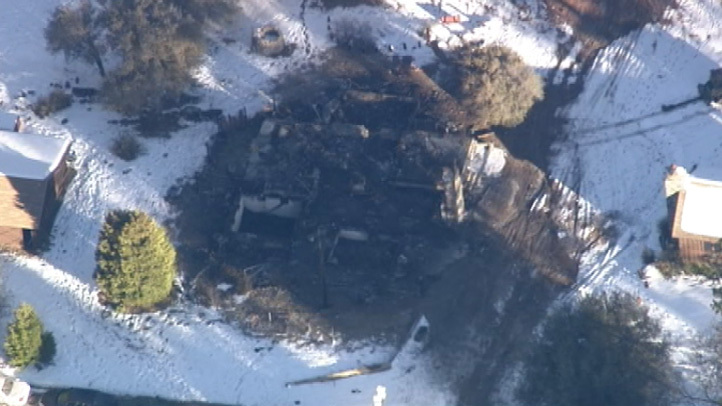 Authorities believe the man – who several witnesses said matched Dorner’s description – held two cabin owners captive at a separate residence, commandeered their sport-utility vehicle and initiated a string of dramatic events – including a carjacking, shootout, stand off and inferno that ultimately burned Martin’s cabin to the ground. "Then the fire. Oh my gosh," Martin said. "That was heart-wrenching to see, the fire. I just started crying. I couldn’t talk at that point." Authorities on Tuesday said that because they believed the person inside the cabin was potentially armed, they would not send firefighters in to extinguish the blaze. By Wednesday morning, it had been reduced to ash and rubble, pictured here. Martin bought the Seven Oaks Cabins in 2005 as a getaway for her family and with the intent to rent out the six smaller cabins on the property, which has been featured in movies and television shows. "It’s hard for me to imagine him in there,” she said. "And I did do that. I imagined, what is he doing? What room is he in?" Made of solid wood paneling and floors, the cabin was built in 1928. Any photos of the 90-year-old cabin were lost in the fire, Martin said. But despite losing a central piece of her family’s history, Martin said she feels like one of the luckier players in the tragic, week-long drama surrounding the massive manhunt for Dorner. "I’m not the worst victim," she said. "The one’s are the families who lost their loved ones. Even my daughter said, 'Mom, it’s a cabin. It’s not a life.'" Detective Jeremiah MacKay, 35, was killed during Tuesday’s gunfight, the San Bernardino County Sheriff said. MacKay is survived by a wife and two children – a 7-year-old daughter and a 4-month-old son. Riverside Police Officer Michael Crain was killed on Feb. 7 while on duty waiting at a red light with his partner. Both slayings – plus those of a former LAPD captain’s daughter and her fiancé – are suspected to be connected to Dorner and the plans he allegedly laid out in a manifesto targeting law enforcement officers and their families.